Technological advances have made it possible to do amazing things like order a pizza from your smart watch, but there’s one problem holding much of consumer tech back: battery life. Despite the computing leaps we’ve made forward, batteries are still a major limitation for pretty much all mobile devices and a lot of photographic equipment. However, a team of scientists at the University of Central Florida’s NanoScience Technology Center may have taken a step toward ending our collective nightmare. 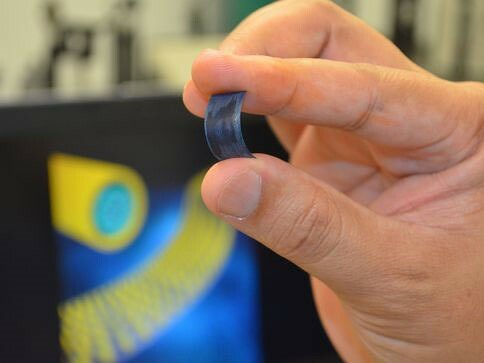 The research team has developed a process for creating flexible supercapacitors that can store more energy and be charged faster than current battery technology. The concept also allows for recharging more than 30,000 times without degradation. “If they were to replace the batteries with these supercapacitors, you could charge your mobile phone in a few seconds and you wouldn’t need to charge it again for over a week,” said team member Nitin Choudhary. Unlike batteries, which use chemical reactions, supercapacitors store electricity statically on the surface of a material which means they can be charged quicker. Previous research projects used graphene for this purpose, but with limited success. The team at UCF has instead been experimenting with newly discovered two-dimensional metal materials that are only a few atoms thick. The newly developed supercapacitors consist of millions of highly-conductive nanowires that are wrapped with those materials. As a result, electrons can pass quickly from the core to the shell and high energy and power densities are produced. “There have been problems in the way people incorporate these two-dimensional materials into the existing systems – that’s been a bottleneck in the field. We developed a simple chemical synthesis approach so we can very nicely integrate the existing materials with the two-dimensional materials,” said principal investigator Yeonwoong “Eric” Jung. At this stage the technology is only a proof of concept and not ready for commercialization. However, the team is in the process of patenting the method and, if developed further, could power the mobile devices, compact cameras and electric vehicles of the future.